A stunning diamond sits in the center of this beautiful 1/10 carat diamond heart pendant in white gold from Apples of Gold Jewelry! Available in your preference of 10K, 14K, or 18K white gold, you can't help but fall in love with the shining finish of this elegant pendant! The heart shape is wider and flatter than other pendants, creating a fun effect and adding a bit of an overlap on the bottom of the pendant. Sized at just over 3/4 inch tall by 1/2 inch wide, this pendant looks pretty for any occasion. The diamond in the center is 0.10 carats, and is rated G-H for color and I1 for clarity. 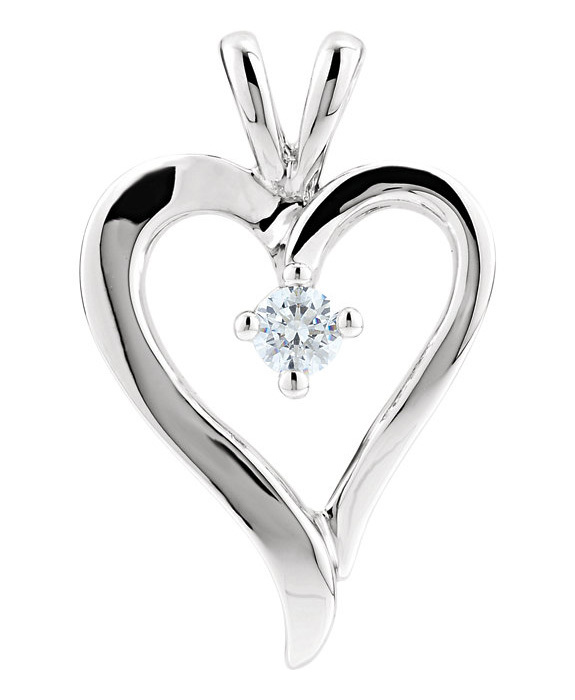 We guarantee our 1/10 Carat Diamond Heart Pendant in White Gold to be high quality, authentic jewelry, as described above.